THE HIPPOI DIOSKOUROI (Horses of the Dioscuri) were four immortal steeds gifted to the Dioskouroi by the gods Hermes and Hera. They served the twins both during their time on earth and after their ascension to godhood. 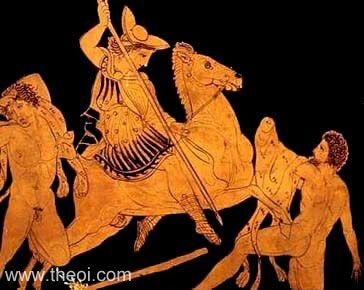 The horses were named Kyllaros, Xanthos, Phlogeus and Harpagos. "The horses given to Hera by Poseidon are called Kyllaros (Cyllarus) and Xanthos (Xanthus) by the lyric poet Alkman (Alcman) : Kyllaros was said to have been given to Polydeukes (Polydeuces), Xanthos to his brother." "Stesichorus in his Funeral Games of Pelias says that Hermes gave the Dioskouri (Dioscuri) Phlogeus and Harpagos, swift foals of [the Harpyia (Harpy)] Podarge, while Hera gave them Xanthos and Kyllaros (Cyllarus)." 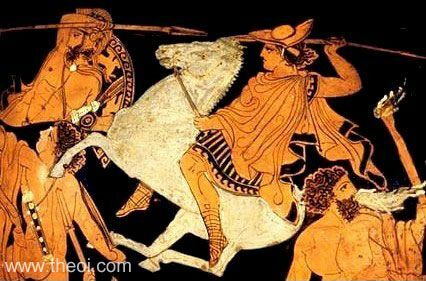 "[On the finest of horses :] Such was Cyllarus, tamed by the reins of Amyclaean Pollux, and those whose fame Greek poets recount, the two steeds of Mars [Ares], and the pair of the great Achilles." "Shouldst thou be pleased to ride a horn-footed horse, with hand more agile on the rein than Castor’s thou couldst guide the Spartan Cyllarus." "[Castor] left [his horse] Cyllarus to fatten upon the grass of Amycle [i.e. when he boarded the ship of the Argonauts]." "[Amphiaraus enters the chariot-race of the first Nemean Games :] Amphiaraus, next favourite for the prize, aloft in his chariot drives Oebalian steeds; thy progeny, Cyllarus [i.e. one of the horses of the Dioscuri], stealthily begotten while far away by the mouth of Scythian Pontus Castor was exchanging for the oar the Amyclean rein. Snow-white his own raiment, snow-white are the coursers that lend their necks to the yoke, his [Amphiaraus'] helm and fillet match the whiteness of his crested plume . . .
[During the race] neither goads nor lashes now suffice, but with shout of name does . . . the Danaan augur [Amphiaraus] chide fleet Aschetos and Cygnus well so-called . . .
[Apollon] lends strength and refreshment [to the horses of Amphiaraus]; swifter than the East wind he flies, as though the barrier were just fallen and he were starting on the race, and calling aloud on nimble Caerus and snow-white Cygnus, plies their necks with blows and shakes the reins upon their backs [and won the race]."